Google in its blogpost says that they have 100 billion deep links into apps in their index now, including popular apps like Facebook, Instagram, Airbnb or Pinterest. 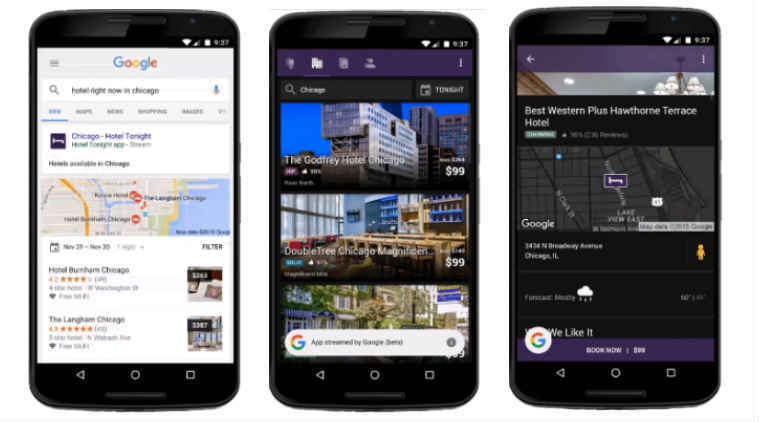 Google Search on mobiles will now start streaming content from apps as well in its search results, even if you don’t have the app installed on your smartphone. Google in its blogpost says that they have 100 billion deep links into apps in their index now, including popular apps like Facebook, Instagram, Airbnb or Pinterest. Google adds that 40 per cent of searches people do on Android surface for app content. Google will show an option to “stream” some apps you don’t have installed, but only on WiFi. So when an app results are shown, and you don’t have the app installed, you can get a streamed version of the app to find what you need and even complete a transaction as though you are in the app itself. Google says it is using a new cloud-based technology for this. Google says it will expand this app-first content further in the future. It was recently reported that Google’s mobile search crawl and deep link to the Facebook app as well.